E-Prime 2.0 introduces the '(until feedback)' Time Limit option. This property is useful for procedures/trials with varying duration that include a FeedbackDisplay object. 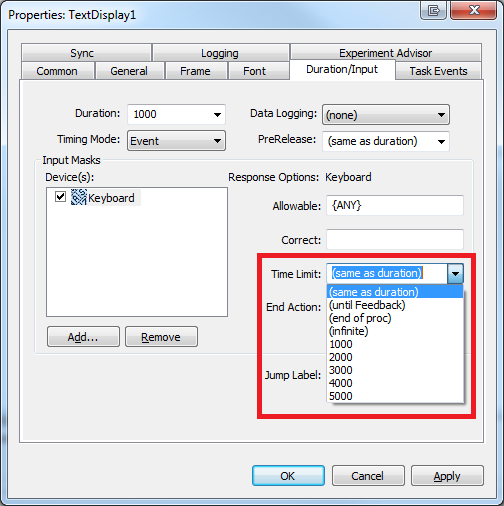 Using a fixed time limit, '(infinite)', or '(end of proc)' could carry into and over the FeedbackDisplay, resulting in the FeedbackDisplay showing inaccurate stats. Using the '(until feedback)' Time Limit option allows for an easier design choice and avoids much of the math involved with calculating the length of the trial and any side effects that might occur when using a longer time limit. NOTE: The use of '(until feedback)' is not recommended on a procedure that does not have a FeedbackDisplay or in which the input object specifying '(until feedback)' appears after the FeedbackDisplay. In those instances, the Time Limit will act as an '(infinite)' time limit.